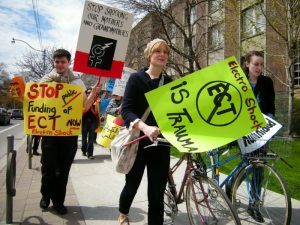 ‘ELECTROSHOCK (ECT) –BRAIN DAMAGE AS THERAPY’ and ‘NO FORCED SHOCK’. Not long after I had read the latest Asylum edition on ECT, I came across a short commentary from The Journal of ECT (Volume 30, Number 2), published in June 2014 and entitled ‘Celebrating 80 Years of Inducing Brain Seizures as Psychiatric Treatment’. The 1927 Nobel Prize for Medicine was awarded for the report that injecting malaria-infected blood remitted neurosyphilis in 3 of 9 patients. That success nurtured the belief that biological antagonisms between medical illnesses could model psychiatric treatments. When the Hungarian neuropathologist Ladislas Meduna found increased gliosis in the brains of epileptic patients and decreases in those with schizophrenia, he saw the illnesses as antagonistic and thought that inducing epileptic seizures might relieve psychosis . Beginning on January 2, 1934, Meduna induced seizures using intravenous pentylenetetrazol (Metrazol) in long-term hospitalized psychotic patients. By 1937, half the 110 hospitalized schizophrenic patients in whom he had induced seizures had returned to the community. In 1938, seizures using household electric currents replaced Metrazol, not for greater efficacy but wholly for ease of use. By the 1950s, grand mal seizures were being induced in thousands of patients in the main psychiatric treatment centers worldwide . 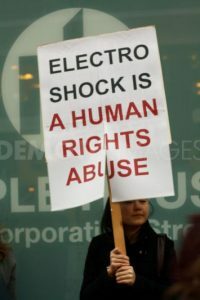 The psychopharmacological revolution of the 1960s ended electroshock’s hegemony. Physicians discontinued its use. Soon, increasing numbers of medication treatment failures revived interest. Films and stories depicting the sordid conditions in state mental hospitals appalled the public. Widespread belief that electricity caused brain damage and persistent memory loss stigmatized the treatment. State legislatures restricted its use. For more than half a century, our research interest focused on minimizing electricity’s hazards. Electrode placement, electricity form, and energy dosing were repeatedly tested; but no modification was without complaint. Magnetic stimulation without seizures did not elicit relief. Nor did stimulation of the vagus nerve or of deep brain nuclei. Meduna’s hypothesis that seizures, not the method of induction, were the basis for remission was repeatedly verified .Interest in mechanism is again aroused, and many hypotheses are discussed in this number of this Journal. An alternative to electricity using the inhalant anesthetic flurothyl is of renewed interest . Ladislas Meduna’s demonstration that induced seizures alleviated severe psychiatric disorders was a remarkable medical advance that developed despite universal fears of epilepsy and of electricity. Although little heralded, the remissions of the illnesses of many hundreds of thousands of the severely ill justify the celebration of this remarkable discovery [my emphasis]. 1. Meduna L. Autobiography. Convuls Ther. 1985;1:43–57, 121–138. 3. Fink M. The seizure, not electricity, is essential in convulsive therapy: the flurothyl experience. J ECT. 2014;30:91–93.